Over the last weekend, I’ve experimented on baking. So far, so good. Beginner baking can be pretty easy with just two things, a mixer and a pressure cooker. Ovens still scare me a little. (Unevenly cooked mush -_-) Pressure cookers are great even if you don’t see what’s going on inside, it comes out perfectly baked. Got good feedback on this cake, so I figured I would share the recipe. Mix all of the ingredients in a bowl using mixer. Brush container in pressure cooker with butter or vegetable oil before putting the mix in. Press “Cake” on your pressure cooker and wait for the magic. Once done, cool cake down to room temperature. Mix all the ingredients in a bowl using a mixer until your preferred texture is achieved. [Watch video above] Cut cake in the middle(horizontal -_-) and spread some frosting in the middle. 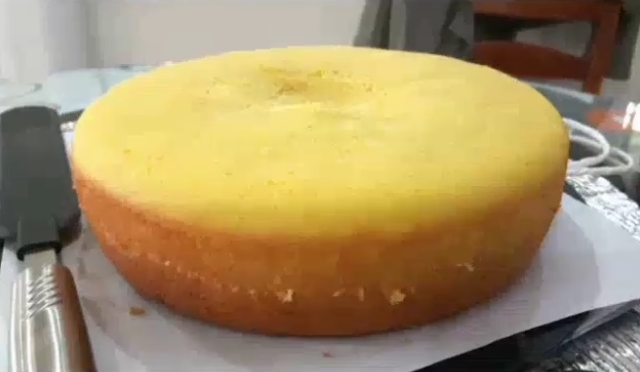 Place the upper part of the cake back and spread frosting around the entire cake. This is an outlet of things I experience, places I explore, food that fits my taste -- or not, and films that I find entertaining. Look around and have a happy weekend! Posts originally written by www.weekendsforever.co admin. Copy only with quotation and link back. Powered by Blogger.